The children and I always look for and bring home souvenirs from the beach. Luckily, it's a fertile hunting ground. It's not unusual for me to have to shake out my bag when we get home to dislodge the sand, pebbles and shells which they've picked up on our visits. My handbag is permanently gritty. Like hunting for sea glass, the pleasure is always in the finding, in the process. Bella and Angus like to search for treasure as much as I do and delight in finding the most colourful stone or unusual shell, which they'll hold up to their ears to so that they can hear the sea. I've only ever found one piece of sea glass on this beach, but what we do have here is shells. At a first glance, everything looks the same. Brown, grey, white. It's a shingle beach and is only sandy at low tide. But then when you sit down and start to look closely, all sorts of colours and shapes emerge. 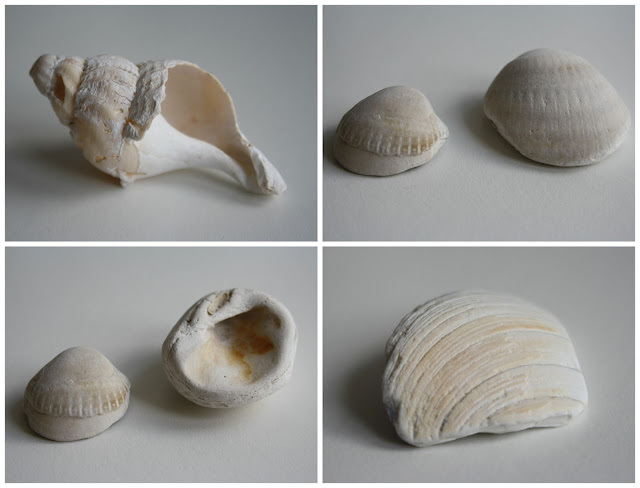 I like the ones which have been so bashed and softened by the surf that they almost look like clay objects, their edges smooth and their markings faded. And I like the way that, on the outside, all you see are quiet and demure tones of brown and cream and white, but turn them over and they glow as though they were lit from within. I love shells too. We have a few jars here on display, and I just finished a little project where I made sketches from them to then drew and paint - I may have found a new obsession. They're such lovely things to study and examine. It must be amazing to live near the beach. Recently up in Scotland I picked up some bits of sea glass and quite a little collection of worn fragments of blue and white pottery. You're right, it is all in the hunting and the anticipation that comes from it. I love them too; you'll soon see that. :) I think it's wonderful that you and your children spend so much time on the beach. It's something I really wish we could do. I'm fascinated by the way they wear and soften often time; think of the endless quantities of water that must flow over them, the wind, the sun. A lovely collection, the shells have a lovely worn charm. I have found lots of blue and white fragments this year. My new favourite thing. I agree that beach combing is a wonderfully absorbing pastime. I'm glad Bella and Angus like it too. I expect they already have some treasures of their own finding in their rooms. love this post. and love found treasure. lovely post lovely pictures. I know I'm supposed to be looking at the shells, but look at those waves ... I feel like I want to dive right in. We beachcomb on shingle every time we go to Suffolk and it's a particular pleasure to find all the sea worn treasures so this post took me right back there, to my favourite shore. How wonderful to be in a fossil part of the world. We don't really get fossils on our coast. I love the way your home is coming on. 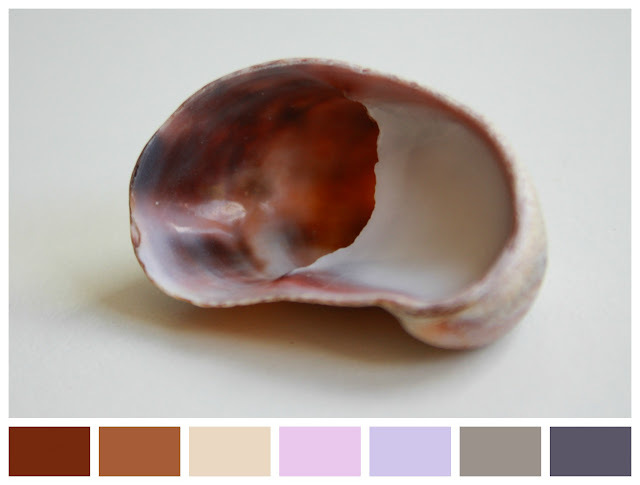 When I go for a walk along a beach I always look out for unusual coloured pebbles, especially those with a hole in the middle and pretty shells. I suppose if I were walking along that beach, I'd carry home quite a few souvenirs, too! Trouble is, once I have them, what do I do with them? The colours are lovely, so soft! I love your photographs in this post. Not only the finds but the waves! It seems to be something that we all do, pocket pebbles, shells and pieces of the natural world that we take back to our houses as reminders of that natural environment. What gorgeous images Gillian, thank you. I have a growing collection of shells, sea glass, blue and white pottery bits from the garden and allotment, and pieces of clay pipe (also from the allotment). My plan is to somehow, some time, incorporate them into a mosaic piece for display in the garden. Maybe go on a course somewhere? In the meantime, thanks for the inspiration. What a beautiful place you have moved to! We like collecting pebbles and shells too. I always wonder, particularly with shells, how long they've been around and where they've come from. I've yet to find a sea glass but I'll keep up my search--we're off to the Yorkshire Coast again in few weeks time. Yes, really lovely photographs, both of the children playing and your found objects. i especially like the pebble with the hole. Lucky you living by the seaside as the southeast begins a heatwave! Lovely shots of the seaside and seaside treasures. I've got a pebble I found on the beach with markings that make it look like it has a smiley face. Love how the sea wears the shells and pebbles. Have a lovely weekend Gillian. Funny how often shells came up isn't it? I must say I'm so enjoying these joyful seaside pics you are bringing us these days. Making me quite envious! Lovely post! I could almost smell the sea when I looked at your pictures. I could spend hours looking for special rocks and shells at the beach. It looks like I'm not alone!